How-to manual, delicious recipes, and super-fast healthy meals. Why did I wait so long to get a pressure cooker? 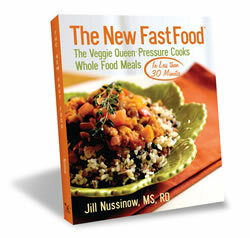 Read on for my review of The New Fast Food: The Veggie Queen Pressure Cooks Whole Food Meals in Less than 30 Minutes . We are giving away this wonderful book on Friday WITH A WMF PRESSURE COOKER. Yes, you read that right! The author, Jill Nussinow, is a culinary educator, Registered Dietician, and freelance writer. She’s been teaching pressure cooking for more than 15 years, and her expertise shines through on every page. 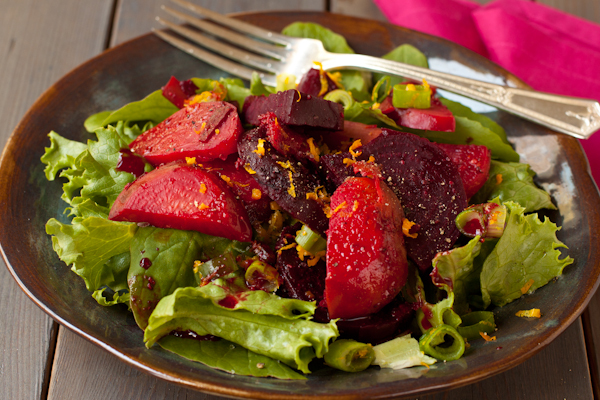 The first recipe that caught my eye was the orange-scented beet salad, shown above. Here are my notes: Soooo yummy. Liked that you don’t have to peel the beets. Went together very fast. Could not find the orange peels to remove them afterwards as instructed but it didn’t matter. Very nice counterpoint with the bitter greens (I served it with curly green leaf lettuce and garden arugula). Needed just a little salt and pepper. I made the garlic parsley mashed potatoes (we all know how I feel about potatoes). They were: Easy, finished in 20 minutes including prep time. Not all the potatoes were cooked through, which might have been my fault of cutting them unevenly. Good, not incredible. 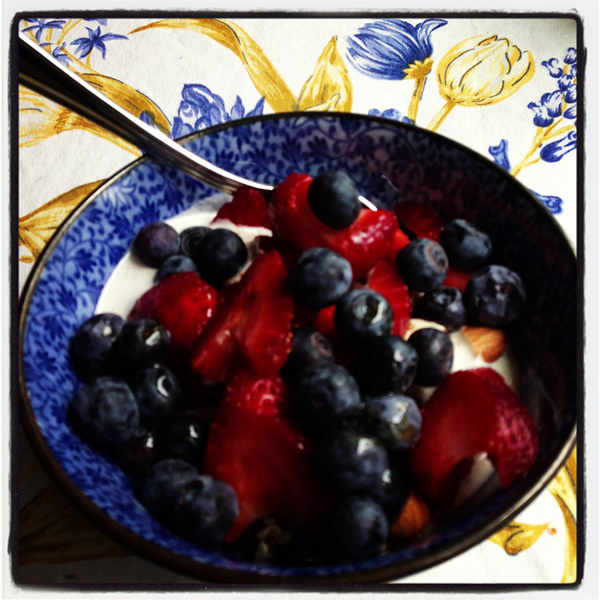 Her red, white, and blue quinoa was delicious with my cashew yogurt, fresh berries, maple syrup, and chopped soaked almonds. I used her perky pintos recipe to cook some ojo de venado dried beans from a Mexican grocery store: Dee-lish. Seemed dry on top when I opened the lid. Stirred, replaced the lid, let sit 10 minutes. Great. Velvety, buttery texture, got better over two days. I made spiced long grain red rice and French green lentils, using what I had on hand—brown rice and red lentils. The flavor was great but it turned into mush. I followed her directions for curried rice and lentils and we both really liked it, especially using the fresh peas from my garden. 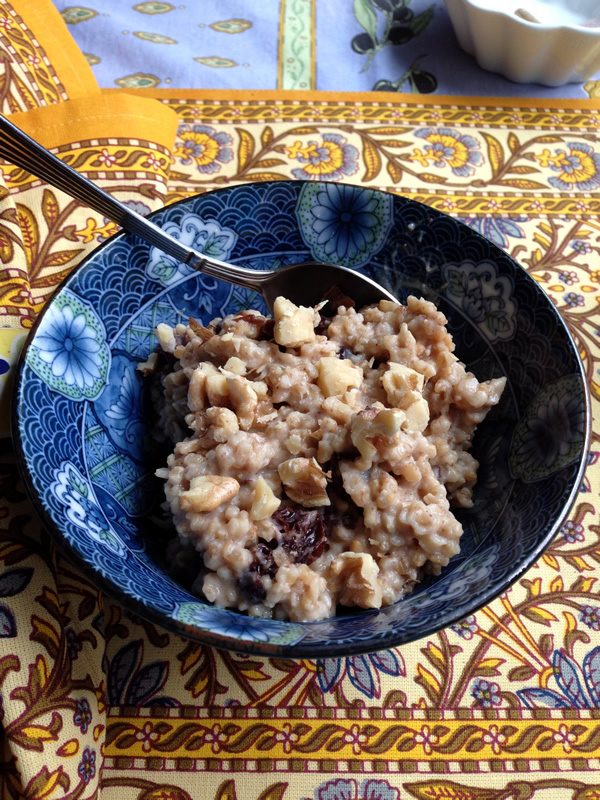 Finally, I made three-minute steel cut oats, which was: Easy. Very tasty. Might include fewer raisins and more nuts. Great for kids and adults. Very, very thorough discussion of pressure cooking, safety, and benefits. Easily makes the case for having at least one pressure cooker. All 138 gluten-free recipes are clearly marked with icons. Besides thorough chapters that get you started, the book is divided into chapters on grains, beans, veggie sides, soups, stews, and desserts. Great variety of recipes. I liked that the pressure instructions are big and bold at the top of each page as well as included in the recipe; this is a thoughtful, user-friendly design element that I have used frequently. Lots of recipe variations and notes are sprinkled throughout, along with handy charts that will be essential to me creating my own recipes in the future. As with many books I’m seeing these days, the type is sans serif, which is more difficult to read, especially on the lighter “instructions” side of each recipe. I appreciate having some photographs but they are all black and white, so some are more appealing than others. As with all pressure cooker recipes, the time frame on some recipes is a bit misleading. While a recipe may only cook at 5 or 8 minutes under pressure, you have to bring the cooker up to pressure, so the entire recipe might take the full 30 minutes. I did complete all the recipes I tested in 30 minutes, including prep. Busy families. People exploring a plant-based diet; athletes and fitness buffs who want optimal nutrition. People who want to save time and money but cook healthier foods. People considering getting a pressure cooker. Come back Friday to enter to win this book and a gorgeous WMF pressure cooker! I love this book – and the beet recipe is my very favorite. I have a friend that doubles the non-beet ingredients just to make extra dressing. SO yummy!